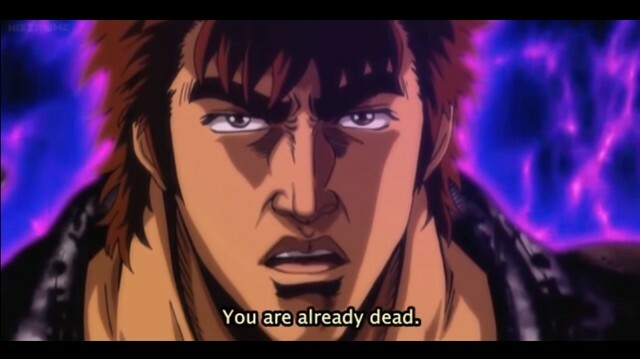 What is Omae wa mou shindeiru’s meaning? The first thing you should know is that this is a Japanese phrase. Hence, the reason I’m going over it here on my website dedicated to helping you learn Japanese. The other thing that you should be aware of is that the line comes from a pretty well-known, and old anime. Of course it does, right?! Well, let’s begin! What Does the Phrase Mean? Alright, so what I would like to do first is give the phrase in its entirety (in Japanese) along with the common English translation. Then I’ll dive into each word so that you can see the individual pieces that are used to construct this iconic saying. Finally, I’d like to touch on an alternate English translation that sometimes gets used, and the reasoning behind it. Now the first word used is お前 (omae) which is kind of a vulgar way to say “you” in Japanese. It is a lot more common to use the other person’s last name when speaking Japanese, in place of the pronoun “you” but anime tends to break this rule of decency and instead use お前. Since this word is pretty rough, it is really only ever used by men in shows, or by women that have that “rough edge” to their personality. In other words, you probably shouldn’t use this when talking to a real person. That being said, it makes perfect sense why it’s used in anime when talking to one’s enemy. The particle は (wa) follows next, and really just lets us know who the topic of the sentence is. Then we get もう (mou) which gets translated as “already” here, but actually has some interesting connotations in the Japanese language. Simply put, the word もう is used when something was in one state of being, but is now in a different state of being. In this case, the other person was in the state of being alive, but now they are in the state of being dead. Hence, the usage of もう in the sentence. Finally, we have 死んでいる (shinde iru) which means someone is “dead” in English. Here’s the thing about this last word: 死ぬ is literally the the verb for “to die” and here it’s in its te-form of 死んで combined with the iru-verb いる which functions like the -ing ending in English. Sometimes you will see that English translation of this phrase as “You don’t even know that you are already dead” instead of the one that I’ve explained above. And the cool thing is that this too is correct! The thing about it is that the Japanese language relies pretty heavily on context to explain certain things. In this case, the phrase is used by the protagonist of the anime when he uses a special move on the bad guys, and they are “dead men walking,” so to speak. I’ll go over those details in the next section, but for now let’s focus on that “You don’t even know” part that isn’t explicitly stated in the Japanese dialog. Basically speaking, it comes back to that that もう from earlier which is used to express a change in state. Since the people who get hit by the hero’s special move are still alive and moving, but about to experience a horrible death no matter what they do, the もう let’s them know something about themselves that they have not yet realized. In English, we like to be pretty explicit and state these kinds of things, but in Japanese the situation extrapolates this short addition to the phrase. Anyway, this wasn’t really necessary to go over, but I thought it was interesting nonetheless. Where Does the Line Come From Originally? I’ve said it a couple of times, but this line comes from an anime. Which anime you might ask? Well, it is a rather old one that came out in the mid-eighties. The name of it is Fist of the North Star in English, and 北斗の拳 (hokuto no ken) in Japanese. It’s a pretty short clip, but basically what happened before is that the main guy hit this villain with a bunch of little punches that didn’t really hurt, but instead hit the bad guy’s vital points, which then caused him to explode a few seconds later. Anyone here seen the Kill Bill movies directed by Quentin Tarantino? If so, you’ll recognize this type of move. It’s the year 199x, and the world is enveloped in the fires of a nuclear holocaust. On the charred remains of the earth’s surface, few remaining groups of humans are struggling to survive. I’ve seen a bit of it myself, and while it is definitely an older anime in both style and story presentation, I can honestly say that I enjoyed it and would recommend it if you like action anime set in that type of scenario. Let me know what your thoughts are on this famous meme or on the show in general.